Poor Caramel Caribou....I keep trying to write about you but keep getting distracted. This was meant to be last Friday's treat. In fact, for a fleeting moment I thought I had bought Stone Ridge Moose Tracks and I was going to throw it in the ring to have a friday night fight with Kemp's Moose Tracks yogurt. Well, I didnt make it to the freezer 'til saturday, and that's when I realized (half remembered) that I bought Caramel Caribou, not Moose Tracks. Oh well, a flavor is a flavor, and this flavor needs testing! 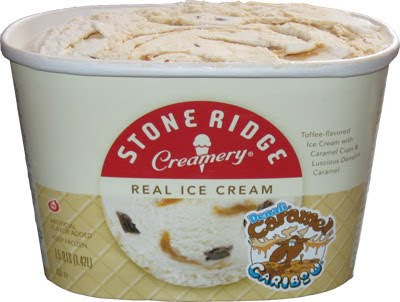 Here's is Stone Ridge Creamery's Denali Caramel Caribou. Since the title isn't very clear, let me say the description is toffee-flavored ice cream with caramel cups & luscious Denali caramel. To be honest, I never really trust a flavor that has to tell you its delicious or luscious or tasty (think about it for a minute, you'll realize I might be on to something here). I usually take a picture of the whole container here, but in this case I've zoomed in a bit to a most intriguing looking set of swirls. They just strike me as so immensely well spaced. Sure, it could be a fluke, but it still catches my eye none the less. You might notice a few caramel cup fragments here and there. "Daddy, are you going to do the penny test?" --- Why yes I am. Those cups may look like the ones from Moose Tracks, but they are actually a bit taller and (note: they are taller, but it's by a few microns....) the chocolate is a little bit thinner. (Actually, I probably should have tried a little harder to cut this one open, it got a little messed up). I had several cups and they were definitely tasty. It's a shame there aren't more of them, but that's what I always say with Stone Ridge products --- I want a cup in every 2 or 3 bites. So, that's the picture story of the ice cream, but I need to tell you about my initial reaction. This ice cream definitely makes a statement with it's first bite. At first, I thought that statement was ***CARAMEL***. It's way stronger than I would have imagined. I expected it to highlight the caramel cups, but instead it takes over the whole show. I'm surprised, and more importantly, I'm not terribly amused. I just wasn't in the mood for that much flavor. I desperately want something to contrast it to, but I've run out of caramel cups. I went in for the second scoop to see if I still felt the same way about the caramel now that I'm ready for it. I took some bites and then I thought about it some more. It seems unfair to just call this a caramel flavor. 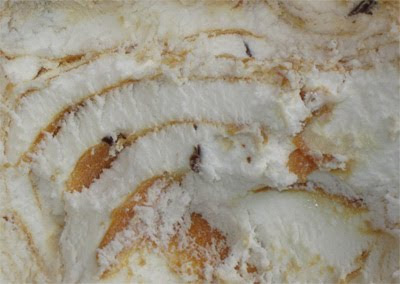 The way the caramel swirl reacts with the toffee ice cream is more robust than that. When I eat this ice cream, all I can think about is Werther's Originals. Ok, technically Werther's are caramels, but my brain keeps wanting to say butterscotch. Let's be honest, the worlds of caramel, butterscotch and toffee aren't light years apart. Maybe my tastebuds just aren't qualified to comment here....Actually, somebody has a bucket of Werther's on their desk, I should take one home and do a side by side comparison. As always, Stone Ridge continues to try and put out a respectable ice cream at budget prices. As always, the texture is just fine ....As always, there aren't enough mix-ins. I wonder if a main stream brand would have more bits, and therefore a more balanced flavor? On Second Scoop: I've tried this a few more times and I just don't like it. The toffee flavor is just too potent with the added caramel swirl.